This post concludes a 17 part series on Darwinian evolutionary frauds. After 17 posts along these lines, I realize I haven’t even scratched the sedimentary surface of the fictional, fraudulent geologic column, if you can pardon the pun. Proverbs 24:3-4 Through WISDOM a house is built, And by UNDERSTANDING it is established; By KNOWLEDGE the rooms are filled With all precious and pleasant riches. I envision a house being engineered in an imagination and then planned to the last detail out of hard earned wisdom. I envision that house being framed out and roofed and finished to square and level because of an understanding of needful things like a solid, level foundation and shoring against the environment. I envision that house becoming a home — filled with a family and love because of knowledge of the truth. Now, just for a moment, imagine falling for a fraud like Piltdown Man, then based on that false knowledge, that intentional fraud, what does your gullibility do to your understanding of God’s purpose and promise? What does that do to your understanding of God’s wisdom in this world? Darwinists practice censorship to avoid debate that would reveal their theories to be baseless and fallacious. Today’s post covers point 3. For this case study, I used the case of “Lucy” and should you need background information on what was once claimed to be our earliest ancestor, please read the introductory post from two Sundays hence. Supporting Detail: Just lots of it. Let’s look at some of the Academic Freedom arguments to start. When a valid argument is put forth that refutes the Darwinian world view by anyone in a position of authority or respect in Academia, the Darwinist majority marginalizes and undermines the advancement of that individual both personally and professionally. Five recent examples were interviewed in Ben Stein’s documentary, Expelled. In summary, Dr. Guillermo Gonzalez Ph.D. was set to become a tenured Professor of Astronomy until he published his book, The Privileged Planet, an argument for intelligent design in the universe based on the Anthropic Principle. The case of Dr. Richard Sternberg Ph. D. is frankly unbelievable. Sternberg served as the managing editor of the Smithsonian-affiliated peer reviewed journal, Proceedings of the Biological Society of Washington. In August of 2004, he chose to publish a tightly argued paper by the Discovery Institute’s Dr. Stephen C. Meyer Ph. D., titled The Origin of Biological Information and the Higher Taxonomic Categories. In summary, Meyer contended that neo-Darwinism has failed to provide a convincing explanation for the massive infusion of new genetic information into the fossil record that is alleged to have occurred 570 million years ago (I do not personally agree with this time line). In publishing Meyer’s paper, Sternberg had merely hoped to provoke a good discussion of the topic. He was quote “absolutely not expecting the hell that rained down” upon him with the paper’s publication. How much hell rained down? In the wake of what happened between the date of publication and October of 2006, in December 2006, the U.S. House Committee on Government Reform issued a most unflattering report on the state of affairs at the Smithsonian Institute entitled, Intolerance and the Politicization of Science at the Smithsonian which I doubt many of you have heard of, much less read. The subtitle reads, “Smithsonian’s Top Officials Permit the Demotion and Harassment of Scientist Skeptical of Darwinian Evolution” and the report accounts for thousands of unbelievable acts of what can only be called pure hatred directed against Sternberg’s person and career for daring to publish a single article that questions the validity of the Darwinian theory in a Smithsonian sponsored peer reviewed journal. The Washington Post spent 7700 words describing what happened to Caroline Crocker, MSc, Ph. 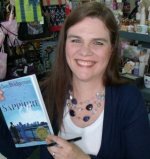 D. after she was banned from lecturing at George Mason University after one lecture explaining the three tenets of Intelligent Design, her contract with the University was not renewed, she was denied tenure, and GMU even coerced her law firm into no longer representing her. All this over one lecture that suggested that neo-Darwinism might not have all the answers to the origin of life on earth. Dr. Robert Marks Ph. D., a tenured “Distinguished Professor of Electrical and Computer Engineering,” endured what can only be described as nearly stentorian persecution at the hands of Baylor University. 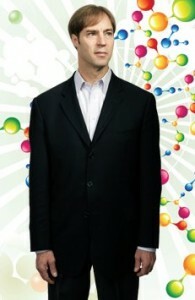 Marks’ website about his research challenging Darwinism was permanently shut down by the Baylor administration, Baylor pressured Marks to cease his anti-Darwinist research, and Baylor as grant administrators even returned grant money given to Marks from a third party organization for the purpose of hiring research assistants to assist in his anti-Darwin lab work. “…perhaps the biggest story yet of academic suppression relating to ID. 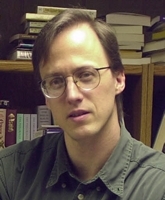 Robert Marks is a world-class expert in the field of evolutionary computing, and yet the Baylor administration, without any consideration of the actual content of Marks’s work at the Evolutionary Informatics Lab, decided to shut it down simply because there were anonymous complaints linking the lab to intelligent design.” — William Dembski Ph. D.
Brain surgeon and SUNY (State University of New York at Stony Brook) Professor of Neurosurgery with a sub-specialty of Pediatric Neurosurgery Dr. Michael Egnor MD went onto an Intelligent Design related blog site and asked “How much information can actually be produced by Darwinian mechanisms?” Instead of taking this question by the horns, Darwinist opponents simply subjected Egnor to endless harsh personal and professional attacks culminating in the article, “Egnorance: The Egotistical Combination of Ignorance and Arrogance” which I will not bother to link to since it is simply vitrio. In my opinion, things like mangling someone’s given name into words like Egnoramous strike me as childish, not substantive. With the release of the documentary, Expelled: No Intelligence Allowed, an underground movement to eliminate Egnor from the staff of SUNY was quickly aborted and tracks covered. This minor controversy allowed Dr. Egnor to state his case autobiographically for Forbes at the time. The ad hominem attacks continue to this day and stand as a clear demonstration of the absolute evil that can dwell in the human heart. In the deluge of hate mail, hate email, and hate blog posts (which are often so profane that I cannot repeat them here) attacking the distinguished doctor and professor, no one actually bothered to take on his very simple questions. For any serious contenders out there, I will restate Egnor’s primary question: How does Darwinian mechanisms produce new biological information? While these cases were documented in a film, they are not the sum total of the voices that Darwinists would like very much to silence. At the Mississippi University for Woman, chemistry professor Nancy Bryson Ph. D. was removed as head of the division of natural sciences in 2003 after merely presenting scientific criticisms of biological and chemical evolution to a seminar of honors students. Philosopher and Mathematician Dr. William Dembski Ph. D.
Could a more true and profound remark have ever been uttered before the US Congress? Ohio State University doctoral candidate Bryan Leonard had his dissertation defense placed on hold after three pro-Darwin professors filed a bogus complaint attacking Leonard’s dissertation research as “unethical human subject experimentation.” His work was based on annual surveys after students in the experiment group had been provided with evidence contradicting the current Darwinian evolutionary theory, while the control group was taught in the traditional indoctrinational fashion. Rather than defend the scientific merits of Darwinian evolution, Darwinists have become obsessed with simply denouncing their opponents as dangerous zealots bent on imposing theocracy. Biology professor P.Z. Myers at the University of Minnesota went as far as demanding the public firing and humiliation of some teachers who expressed doubts about Darwin. 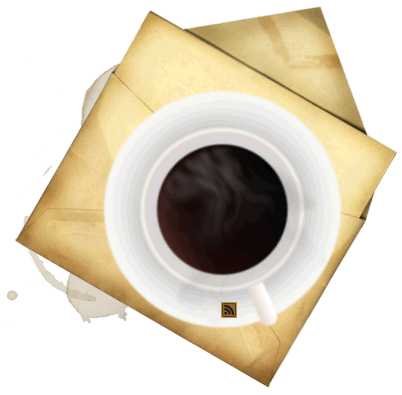 “…the evidence is unassailable. The most reasonable scientific explanation for functional biological complexity–the genetic code and the intricate nanotechnology inside living cells–is that they were designed by intelligent agency. There is no scientific evidence that unintelligent processes can create substantial new biological structures and function. There is no unintelligent process known to science that can generate codes and machines. I still consider religious explanations for biology to be unscientific at best, dogma at worst. But I understand now that Darwinism itself is a religious creed that masquerades as science. Darwin’s theory of biological origins is atheism’s creation myth, and atheists defend their dogma with religious fervor.” Dr. Michael Egnor MD., professor and vice chairman of the department of neurosurgery at the State University of New York at Stony Brook, in Forbes. When it comes down to a question of whether or not Darwinists practice censorship against opposing views, there is really no argument. It is a matter of record. A matter of fact. It appears to be part and parcel with the Darwinist religion. Note the thoughtful gaze, human hands and feet, and human gait. Of course, Darwinists have known about every single one of these points for decades, in fact not long after the 1974 discovery of Lucy. 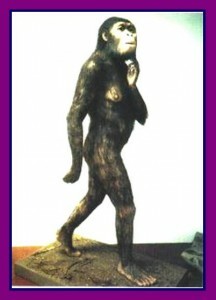 Lucy as depicted by the Saint Louis Museum. Neither apelike eyes nor feet were used. 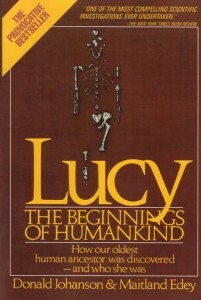 “In Lucy’s case, her ribs are conical, like those found in apes.” Brad Harrub (Ph.D. Anatomy and Neurobiology) and Bert Thompson (Ph.D. Microbiology), The Truth About Human Origins, 2003, p. 47. It suggests to us that the mechanism of lateral pelvic balance during bipedalism was closer to that in apes than in humans.” J. Stern & R. Sussman, American Journal of Physical Anthropology, 1983, pp. 291 & 292. Biology: Concepts and Connections, 2000, p. 404. Why do you think she answered so energetically that an obvious perpetrated and known fraud must be perpetuated? We know that Lucy feet could not have made the Leatoli footprints. It is patently impossible that feet like hers left those impressions. Yet textbooks perpetrate the lie to this day. “Some 3.7 million years ago, several bipedal (upright-walking) human animals of the species Australopithecus afarensis left footprints in damp volcanic ash in what is now Tanzania in East Africa.” Biology: Concepts and Connections, 2000, p. 404. Why do you suppose that is? Do you suppose there is an agenda there? Would it not be a better solution to just stick to the facts instead of teaching the interpretations as if they were facts? Especially when the interpretations are KNOWN to be non-factual? But when one unprepared Pennsylvania school district wanted to present facts, they were sued and dragged through the mud. The “evidence” presented at the Dover trail? No peer reviewed work. Maybe we should ask Sternberg about how easy it is to peer review work that contradicts Darwinism. No “tenured” professors teaching contradictory theories in colleges and universities. Maybe we should ask the hundreds of college educators who have been denied tenure on the basis of opposing Darwinism why that is the case. No centers for study or peer review in mainstream education. Maybe we should ask Dembski how easy it is to set up a serious center for the study of contradicting ideas. In other words, their entire “evidence” was fallacious and based entirely on censorship. Try to portray Lucy as a tree climbing monkey who has nothing whatsoever to do with human origins and I think you might encounter censorship such as you have never seen. Ultimately, it all comes down to WHY? Why on EARTH would Darwinists turn to hatred and unbelievable levels of personal and professional attacks to eliminate even the DISCUSSION of ideas that tend to contradict Darwinism? Why? Romans 1:20-25 For since the creation of the world His invisible attributes are clearly seen, being understood by the things that are made, even His eternal power and Godhead, so that they are without excuse, because, although they knew God, they did not glorify Him as God, nor were thankful, but became futile in their thoughts, and their foolish hearts were darkened. Professing to be wise, they became fools, and changed the glory of the incorruptible God into an image made like corruptible man-and birds and four-footed animals and creeping things. Therefore God also gave them up to uncleanness, in the lusts of their hearts, to dishonor their bodies among themselves, who exchanged the truth of God for the lie, and worshiped and served the creature rather than the Creator, who is blessed forever. And that, my beloved, is the reason.